Pop off your rear seat and click on a colour matching seat cowl for that race bike look. 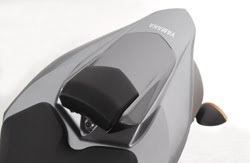 Also known as a solo seat, the seat cowl installs in minutes and fits the Yamaha YZF-R1 model years below. All seat cowls are colour-matched to the model year of your R1 and have a black seat cushion. See our online store for 2002 R1 accessories or select the year of your bike. To search for your R1 parts such as complete cowling, tail lights, brakes, etc. and view microfiche browse our Yamaha parts pages. I am very happy with my order from you. I am no stranger to web shopping, and yet again I was not disappointed. Thank you for good service. I wish all Yamaha shops had a tiny part of your professional service. Next time I need parts, you will be the first to know!